This summer, The Vault at Old Billingsgate has undergone a complete AV overhaul and now offers a brand new, comprehensive and intuitive lighting and audio visual system. 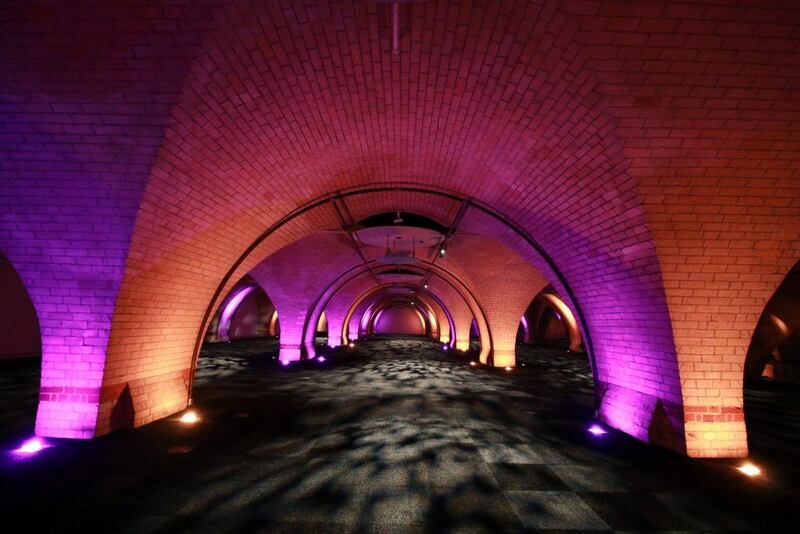 The installation, which features bright LED uplighters recessed into the ground, illuminate the beautiful brick arches throughout the space, and can be configured to any colour of your choice at the touch of a button. In addition, the Well area of The Vault at Old Billingsgate features a drop-down 16ft wide electric projection screen and high output 15,000 Lumen projector making the area ready to go for presentations and screenings. Suitable for conferences for up to 220, dinners for up to 600 and standing receptions and parties for up to 900 guests. To find out more about hosting your nest event in The Vaults or any of the other 70 prestigious venues across capital and the UK we’re listed at Contact us.